This guy’s arm and shoulder tattoo is intricately designed in a swirl tribal pattern, accompanied by a Celtic arm band. It’s not hard to imagine how long this tribal tat must have taken to ink on this guy’s arm and shoulder…check out how complex the tribal design is! The guy in this photo had a tattoo artist ink a pretty cool tribal tat on his right shoulder, extending down his arm, almost to his elbow. 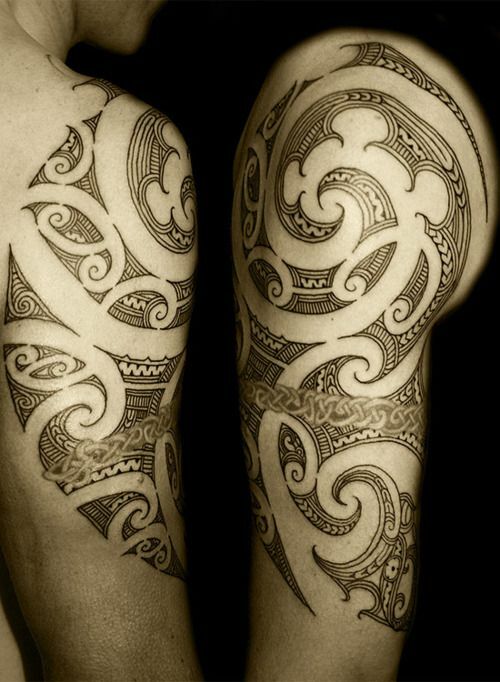 The tribal arm tattoo is inked in black and white and includes a swirl pattern, a Celtic arm band, and a whole bunch of tiny line and swirl designs. Although arm bands like the one this guy has are pretty common, the large tribal tattoo this guy got surrounding the arm band really makes it unique and stand out. Also, even though the swirl design in this guy’s arm and shoulder tattoo is rather simple, all the tiny lines and swirls included within the pattern make the tribal tat look very complicated and ornate.